ID/PW 분실 우려 없이 안전하게 내 정보 및 자산을 지킬 수 있는 가장 간편하고 안전한 인증 서비스 입니다. 피싱, 파밍 등으로 개인정보가 유출되어도 안심하고 이용 할 수 있습니다. 개인정보나 계정 정보(ID/PW)가 유출되어도, 본인 소유의 핸드폰으로 인증을 받아야만 서비스 접근이 가능하도록 하여, 해커의 접속을 원천 차단하는 보안서비스입니다. 중요한 정보의 불법 유출을 방지합니다. 중요하고 민감한 정보가 다수 포함되어 있는 클라우드의 완벽한 계정보호를 위해 로그인 시 ARS전화인증으로 불법인가자의 출입을 원천 차단하는 서비스입니다. 2차 금융사고를 사전에 방지할 수 있습니다. 아이디 혹은 비밀번호를 찾을 때 불필요한 본인인증으로 인한 복잡한 절차를 ARS 인증으로 간편하게 대체하고, 비교적 높은 비용의 본인인증 비용을 절감 할 수 있는 서비스 입니다. 번호로 신속하게 ID/PW 확인 할 수 있습니다. 인터넷 및 스마트폰 뱅킹을 통한 이체 시 사용자가 이체금액에 상관없이 사전에 등록되어 있는 전화번호로 이체 여부를 직접 결정하는 완벽한 보안 서비스입니다. 등록 하여 지식 기반 인증이 가능합니다. 이체결과 확인 할 수 있습니다. * 통신사 요금제에 따른 이용요금과는 별도로 추가 요금이 부과되니 양지하여 주시기 바랍니다. 전화승인 ARS 미수신(통화 중, 통신장애 등)하거나 (승인여부) 무응답 시 해당 이체거래는 성립되지 않습니다. 본 서비스는 즉시이체 및 예약이체에 모두 적용되며, 자동이체등록 및 에스크로 이체에는 적용되지 않습니다. 등록된 승인전화번호 등의 변경 시 변경에 관한 사항을 즉시 은행에 신고하여야 하며, 신고 지연으로 인한 통지내역 미확인 등이 발생할 경우에는 은행은 책임을 지지 않습니다. 등록된 승인전화번호는 인터넷 뱅킹 전화승인서비스 용도로만 이용됩니다. 기업 내에서 사용 하고 있는 서버에 인가된 사용자 만을 출입 허용하여 내부 정보 유출 및 외부 접근자를 완벽하게 차단해주는 보안 서비스 입니다. 보안성 상승효과를 볼 수 있습니다. 사내의 중요 정보들이 대량으로 외부 유출되는 것을 방지하기 위해서 일정 용량 이상의 메일을 외부로 발신하거나 수신할 때 사용자인증을 거친 후 보내거나 받을 수 있는 보안서비스입니다. 비밀번호를 잊어버려서 로그인을 하지 못할 때, 해당 IT담당자의 확인 없이 요청자의 본인인증을 거쳐 비밀번호를 자동으로 안내해주는 비밀번호 자동 초기화 서비스 입니다. 절약 효과를 볼 수 있습니다. 하루에도 몇 번 씩 찾아오는 방문객들을 일일이 대응하는 것은 업무 효율성을 저해하는 한 요소입니다. 사전에 방문 등록을 진행한 사람이 내방을 하면, ARS로 담당자에게 알려주어 방문객을 회의실이나 사무실 등으로 자동으로 안내해주는 서비스입니다. 오픈마켓에 판매자 등록 시 설정한 대표 전화 번호로 3개월, 6개월 마다 ARS전화인증을 진행합니다. 만일 대표전화번호를 인증 받지 않을 경우에는 상품의 등록/수정이 불가능합니다. 판매자의 대표번호를 지속적으로 관리하여 고객과의 커뮤니케이션에 문제가 없도록 하고, 판매자 사기 방지를 할 수 있는 서비스입니다. ‘전자금융사기예방 서비스’는 현재 모든 은행에서 사용하고 있는 서비스로 100만원 이상의 금액에 대해 본인소유기반의 전화로 인증함으로 보이스피싱, 파밍 등의 전자금융사기를 예방해 주는 서비스입니다. 보안수단을 제공 할 수 있습니다. 자동이체납부(CMS)는 정기적으로 발생하는 서비스 요금 등을 납부자가 동의한 계좌에서 자동으로 출금되는 서비스로 다양한 분야에서 사용 중 입니다. 최근에 납부자의 동의 없이 CMS계좌에서 무단으로 출금을 하여 사회적으로 큰 파장을 일으킨 사고가 있었습니다. 이에 자동납부 서비스를 이용할 때에는 납부자의 동의가 반드시 필요하며, 동의에 관한 증거자료를 보관하여야 합니다. CMS 부당인출 및 펌 뱅킹을 이용한 부당인출 사고를 방지합니다. 납부자로부터 자동납부 동의자료를 금융회사 또는 전자금융업자에게 전달하여야 합니다. 녹취, ARS 등의 방법으로 납부자의 동의를 받습니다. 될 수 있는 부분을 미리 준비합니다. 신용카드 30만원 이상 인터넷 결제 및 적립금 사용시 결제 정보 입력 후 본인 소유 기반의 휴대폰으로 사용자를 최종적으로 확인하고 결제하는 안전한 보안 서비스입니다. 카드소유자 등록 전화로 직접 인증 함으로써 도용사용을 방지할 수 있습니다. 본인 인증을 함으로써 불법거래를 막을 수 있습니다. 온라인 환경에서 사용자 개인의 고유한 생체 정보(지문, 홍채 등)를 이용하여 편리하고 안전하게 인증하기 위한 세계 기술 표준으로, 개인 생체정보를 기업서버에 저장않고 네트워크 전송도 없어 생체정보 탈취 위험이 없으며, 단말 분실해도 본인의 생체정보 없이는 타인의 부정사용이 불가능한 서비스입니다. 서비스 본인확인 요청 시 등록된 기기로 모바일 통신망을 통해 인증코드 전송 후 앱 화면에 표시된 안내에 따라 본인이 직접 승인하는 방식의 앱인증 서비스 입니다. 등록된 휴대폰으로 인증코드를 문자로 전송하여 PC화면에 인증 코드를 입력 후 본인을 인증하는 방식의 SMS 인증 서비스 입니다. 본인 명의의 휴대폰으로 전화를 걸어 ARS 안내에 따라 본인이 직접 승인하는 방식의 전화승인서비스입니다. 자연재해, 비상사태 등이 발생하였을 경우, APP, SMS, ARS 등 다양한 방식을 통하여 긴급 상황을 빠르고 모든 대상에게 누락 없이 전달할 수 있는 유일한 서비스입니다. 은행이나 관공서 등 기관에 제출된 증명서의 진위여부를 자동으로 확인하여 업무효율성 및 집중도를 극대화 할 수 있는 서비스입니다. 가능하여 일처리 속도가 대폭 개선됩니다. 평소와 다른 패턴이거나 부정거래로 의심되는 거래 발생 시, 자동으로 고객에게 전화가 걸려가면 고객이 직접 본인 전화기에 인증을 해야만 정상거래로 처리됩니다. 전 자동화 시스템으로 인건비 최소화 가능합니다. 해커가 유출된 금융정보나 거래정보를 활용하여 부정거래에 이용하려 해도, 보안이 강력한 ARS전화인증으로 부정사용을 방지합니다. 부정 사용자에 의한 공인인증서의 부정 발급을 막기 위하여 본인소유의 핸드폰으로 인증을 받은 뒤 발급해주는 서비스입니다. 전화를 받고 인증번호만 입력하면 됩니다. 전화를 걸 때 내 전화번호가 아닌 내가 설정한 전화번호(회사 전화번호, 서비스 대표번호)로 전화를 걸어 전화번호 노출 방지 및 업무 효율성을 높여 주는 서비스 입니다. 개인전화번호를 사용하지 않아 통신사에 통화기록이 남지 않습니다. 차량에 연락처 비치 시 실제 연락처가 아닌 안심번호를 비치하여 전화번호 노출로 인한 보이스피싱, 스토킹 등과 같은 각종 범죄로부터 여성운전자를 보호해주는 서비스 입니다. 개인이 직접 등록할 수 있는 기능을 모두 지원합니다. 알림 서비스를 통해 부재 내역을 제공합니다. What is a login account protection service? Even if your personal information or account information (ID / PW) is leaked, access of hackers are blocked as this security service lets access to your service only possible by authenticating with your own mobile phone. Prevents illegal leakage of importantinformation such as personalinformation and internet assets. authentication to block hacker access. What is a cloud account protection service? 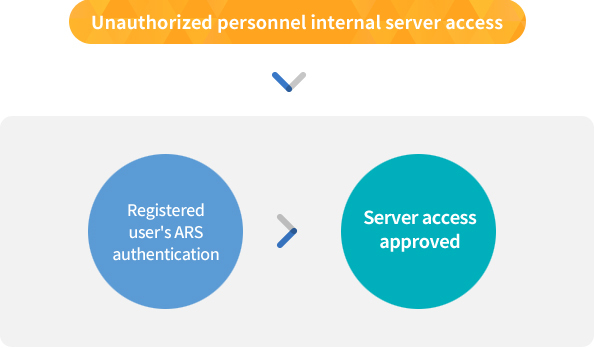 It is a service that prevents unauthorised access through the use of ARS telephone authentication when signing in to your cloud account, which contains a lot of sensitive and important informations. in the cloud safe and secure. can be prevented in advance. What is an ID / PW Search Service? It is a service that can replace the complicated procedure of unnecessary identity verification by using the ARS authentication when searching for an ID or password, and can also reduce the cost of authentication of a relatively high cost. not entering any additional information. compared to other SMS authentications. customer's carelessness, or even when the customer is sleeping. What is the ARS 24 hours account protector? It is a complete security service that allows the user to decide whether to transfer money or not using the pre-registered phone number, regardless of the transfer amount, when transferring via internet or smartphone banking. additional program in any environment. designated only for the user. results on the transfer result screen. * Please note that an additional charge will be charged separately from the service charge which is according to the carrier's fare plan. If the ARS is not received (already in call, communication failure, etc.) (consent of approval), or non-response, the corresponding transfer transaction will not be established. This service applies to both direct and prepaid transfers. It does not apply to direct debit enrollment and escrow transfers. In case of changes of the registered authentication phone number, you should notify the bank immediately about the change. In case of unreliable notification due to delay of the notification, the bank shall not be held responsible. Registered authorization numbers are only used for internet banking phone approval services. What is a VPN server access control service? It is a security service that allows only authorized users to access the server that is used in the enterprise and completely blocks internal information leakage and external accessors. security is expected to be enhanced. What is the Mass Mail Authentication Service? It is an email security service where mails can only be sent or received after user authentication for mails of a certain capacity or more in order to prevent a large amount of important information leaking outside. documents from being leaked to the outside. mass mailings possible of containing viruses. that handles "frequently forgotten password"
What is the automatic password reset service? It is a password reset service that automatically informs the password to the requestor after authenticating even without the confirmation from the IT staff when the password is forgotten and you can not sign-in. separate confirmation from the IT department. lost people, and can focus on their work. corresponding labor savings can be achieved. What is an access control service? Responding to visitors several times a day is a factor that may decrease our efficiency. If a person who has registered for the visit in advance visits, the ARS will notify the person in charge and automatically direct the visitor to a meeting room or an office. What is the seller's representative number authentication service? ARS telephone authentication is carried out every 3 months and every 6 months to the representative phone number set when registering the seller in open market. If you do not authenticate the valid phone number, you will not be able to register or modify any products. It is a service that can keep the representative number of the seller constantly in contact in order to prevent communication errors with the customer and prevent the fraud of the seller. validity of the seller's representative number. of buyers due to fraud. What is electronic fraud prevention service? 'Electronic Financial Fraud Prevention Service' is a service that is used by all banks. It is a service to prevent electronic phishing scams such as voice phishing and pharming by authenticating the amount of over 1 million won transactions by phone authentication. 1 million won through additional authentication..
to provide safe security measures to customers. What is the Certificate Legitimation Automatic Verification Service? It is a service that can maximize work efficiency and focus by automatically checking the authenticity of a certificate submitted to an institution such as a bank or a government office. a document whenever you want. it significantly improves workflow speed. What is a Fraudulent Transaction Confirmation Service? If there is an unusual pattern or suspicious transactions, the customer is automatically called then the customer must authenticate to his or her phone to process the transaction as normal. for the payer in automatic transactions. What is the Automatic Transfer Payment (CMS) Consent Record Recording Service? Automatic Transfer Payment (CMS) is a service that uses automatic withdrawals from the account the payer has agreed to pay for service charges incurred on a regular basis. Recently, there has been an accident that caused a big wave of societies due to an unauthorized withdrawal from the CMS account without the consent of the payer. Therefore, when using the automatic payment service, the consent of the payer is required and the evidence of consent must be kept. Prevents unfair withdrawal accidents using CMS unfair withdrawal and firm banking. Due to Article 15 (1) of the Electronic Financial Transactions Act and the Article 10 of the Enforcement Decree of the Electronic Financial Transactions Act, the automatic transfer payment institution shall automatically forward the automatic payment agreement data from the payer to the financial institution or electronic financial service provider. The consent of the payer is obtained by recording, ARS, etc. What is a credit card authorization service? It is a security service which lets the users to confirm the transaction using the user's mobile phone and entered billing information when 300,000 won or more is spent through the internet payment and deposits. number using the registrated telephone number. What is the Easy Payment User Authentication Service? Even if a hacker tries to use leaked financial information or transaction information for fraudulent transactions, it prevents illegal use by strong ARS phone authentication. numbers are required to be entered when a call is received. What is an authorized certificate management service? It is a service that certifies with a cell phone owned by the user in order to prevent illegal issuance of a certificate by a fraudulent user. and enter the authentication number. What is FIDO Authentication Service? It is the global technology standard for conveniently and securely authenticating users' personal biometric information (fingerprint, iris, etc.) in an online environment. It does not store personal biometric information in a corporate server or sends it through the network. 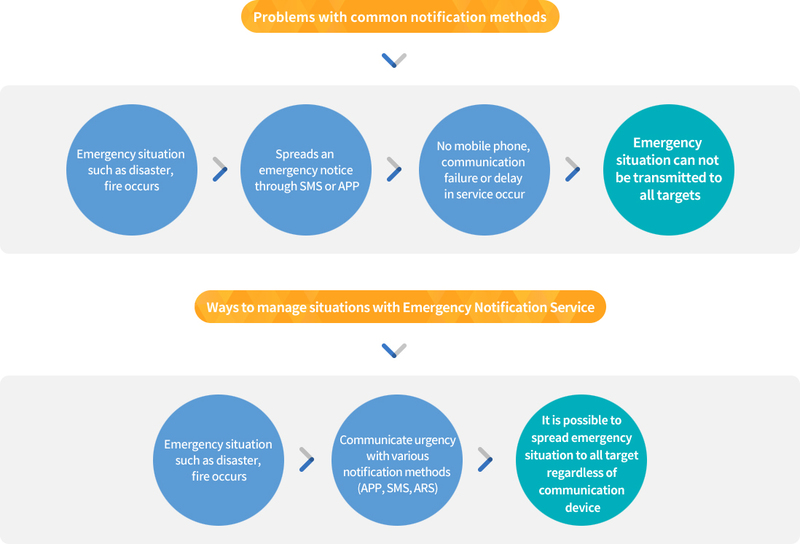 Therefore, it is a service that can not be illegally used by others even if the terminal is lost unless the biometric information of the user is available..
What is Emergency Notification Service? What is Single senior management service? about phone number exposure when calling. 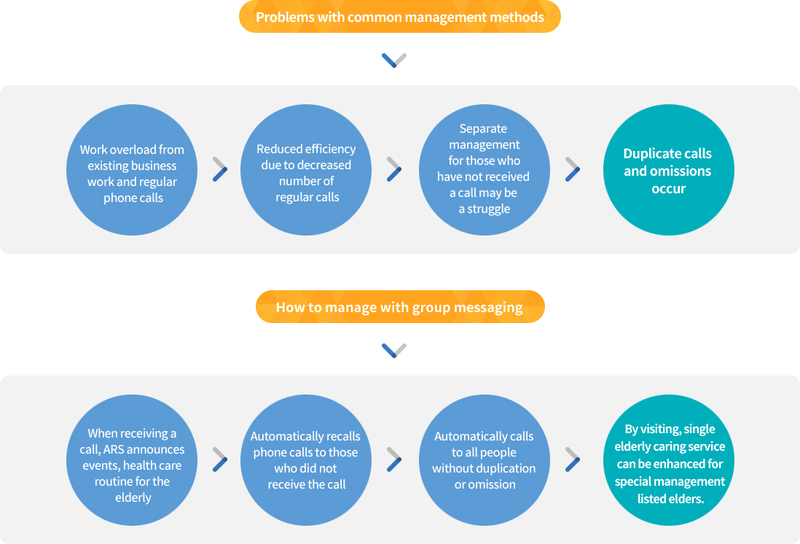 What is the New-concept Mutual Protection Safe Calling? When you make a call, it is a service that prevents phone number exposure and improves work efficiency by only using the phone number (company phone number, service representative number) set by the user, not the personal phone number. No call records are recorded to the service provider as personal phone number doesn't get used. landline number over your mobile phone. providing advanced security features for each other. What is the chameleon service? It is a service that protects female drivers from various crimes such as voice phishing and stalking using phone number exposure by providing a security number instead of the actual contact number when leaving contact cards on the vehicle. individual for the security phone number. it for a certain period. What is App Authentication Services? When requesting service identification, the application authentication service sends the authentication code to the registered device through the mobile communication network and approves the service directly according to the instructions displayed on the app screen. What is an SMS authentication service? SMS authentication service by sending authentication code to registered mobile phone in characters and entering authentication code on PC screen. You can check your identity through the Internet and mobile phone. What is a two-channel telephone authentication service? This is a two-channel (2-track) authentication service that checks your identity through a different channel (Internet of Service) and a different channel ( mobile phone), calling your mobile phone and approving it directly according to the ARS instructions.